Remember John Franklin Stephens’s powerful speech: “I am a man with Down syndrome and my life is worth living”? and Charlotte Fien, who spoke out after Ben Achour said to the UN that babies with Down syndrome should be “eliminated”? 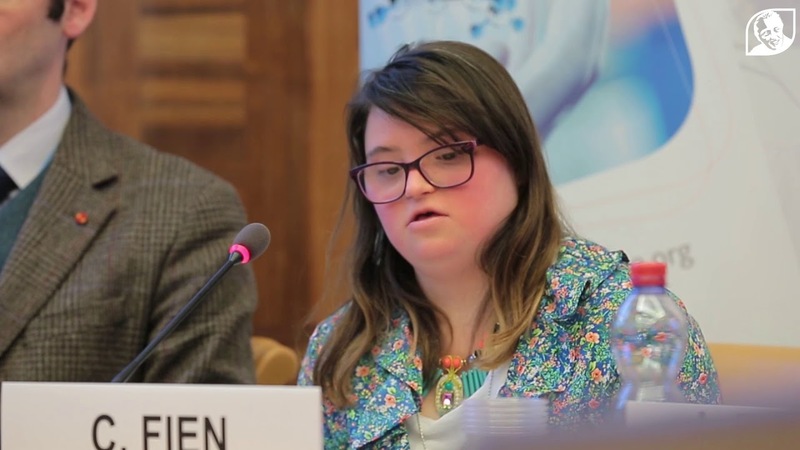 This week the two spoke before the United Nations at an event co-organized by the Jerome Lejeune Foundation for the 37th session of the Human Rights Council and World Down Syndrome Day. People like me tend to be a little shorter because our arms and legs and shorter. Our faces are a little bit flatter because our cheekbones and noses don’t stick out from our faces as much. All that adds up to a person who is a little bit uncommon, in my case, uncommonly handsome. Don’t worry, I am very accepting, very inclusive. I won’t think less of you just because I have more chromosomes than you do. How would the world react if a nation proclaimed that it would use genomic testing to make itself ‘Unpopular ethnic minority free’ by 2030? The U.N. has a name for this, but we need not go there. My generation owes an awesome debt to organizations like the [Jerome] Lejeune Foundation and Special Olympics for freeing us from the prison of neglect. A mother’s womb is the most dangerous place for babies with Down syndrome. You can try to kill off everyone with Down syndrome by using abortion, but you won’t be any closer to a perfect society. You will just be closer to a cruel heartless one. As long as people with Down syndrome as kept out of mainstream society, we will be feared, not accepted. We applaud John and Charlotte for their powerful words in defense of those with Down syndrome.